The Ram-Mount Triple Base | OhGizmo! By David Ponce on 05/30/06 • Leave a comment! This is for the man who has everything, and no way to bring it with him on his bicycle. You know who you are. 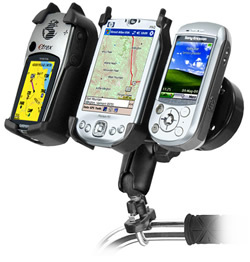 With the $7.63 Ram-Mount Triple Base, you’ll be able to take your cell, your PDA and your GPS along with you. And we salute you Mr.Gadget Man, because we both know that shiny consumer electronics make the best surrogate friends. They should never, ever be left alone. That would hurt their feelings.